Well, it was only a matter of time before we had the recipe for Baclava (or Baklava) here! It's probably one of the best-known sweets from this area of the world and quite rightly so, in my opinion! You should be able to obtain the sheets of filo pastry where you live - it's available in most parts of the world, I believe. Cut all the sheets of filo pastry into a circular shape to fit the round, medium-sized oven dish you will use. Butter the oven dish and start placing 20 sheets of filo pastry individually, buttering each one as you do so. Mix the cinnamon with the walnuts and add the mixture to the dish on top of the 20 filo sheets. Place the other 20 sheets on top, again individually and buttering each one as you do so. Place the dish in the fridge for 10 minutes. When you take it out, cut the baklava into diamond shapes (see photo) making sure you make the cuts right to the bottom. Spray it with water and bake it in a pre heated oven at 150 C for 90 minutes. Put all the ingredients for the syrup in a pan, bring to the boil and continue boiling for 3 minutes. 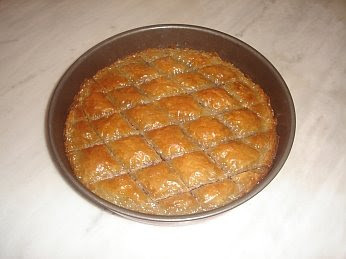 When you remove the baklava from the oven, pour the syrup evenly on top of it. This has to be done when both are still hot. Oh my is that scrumptious looking. I copied and pasted the recipe, gonna have to try them, Nice job. Hmm this looks great! Although there's a shop nearby my home that sells this... I've got to try to make it myself one day :) instructions copied! In reply to your question, Anonymous, the thing with the syrup is that it is absorbed into all the layers ofthe sweet. If you use honey, it won't be absorbed. You could water down the honey, I suppose, but it really wouldn't be the same. I really must try to make this!! I've used philo dough for apple streudel...but some of your tips here would even help me make that better!! Yummm! Thanks!